Walnut and orange scones are the perfect afternoon tea cake! 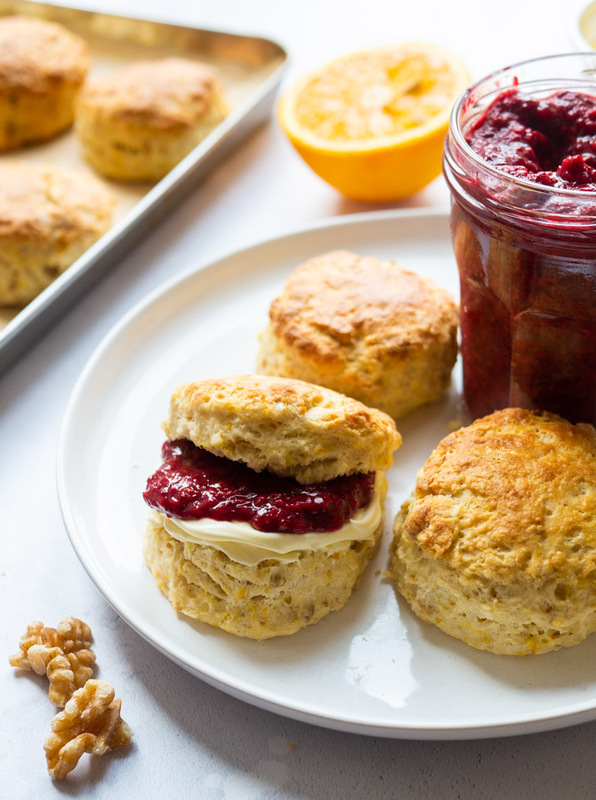 The orange zest in this scone recipe adds a delicate citrusy flavour, that is complemented further by the addition of cream and raspberry jam, while the walnuts add a little extra crunch. 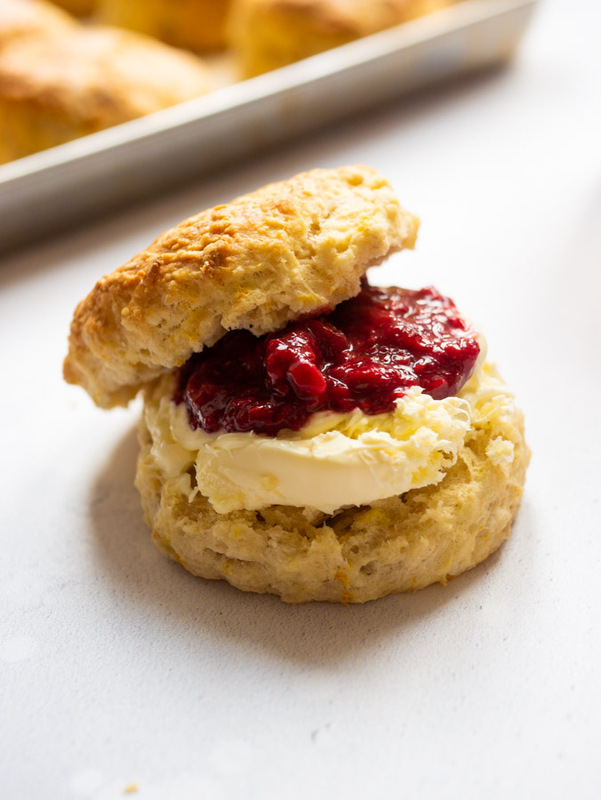 This is an easy scone recipe that comes with step by step instructions and photographs – so you get the best scones every time! I think scones were one of the first things I ever learned to bake. I can remember making them in food tech lessons, learning how to rub butter into flour, using a knife to cut the ingredients together and watching them grow in the oven. These days I don’t do a huge amount of baking – living miles away from 99% of my friends and family means it’s not often people come round for a cuppa and a slice of cake. But I do like to bake scones – because I reaaaallllly love eating them. Particularly these walnut and orange scones. 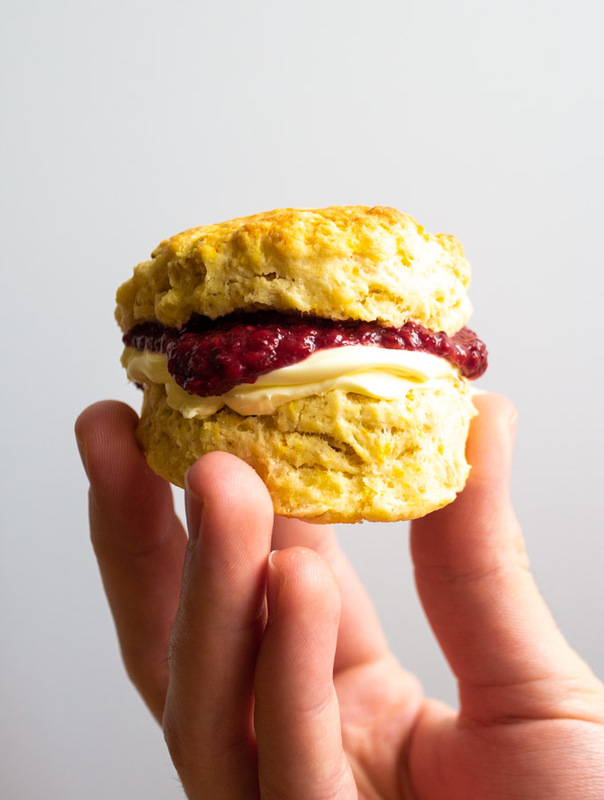 Throw me in a coffee shop and there’s around a 99% chance I’ll order a scone – so long as there is clotted cream and raspberry jam to slather on top. It’s my kryptonite. 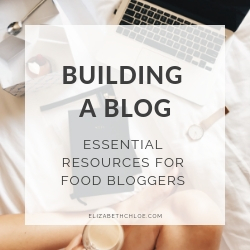 When it comes to making scones there’s a good chance you’ll have all of the basic ingredients in the house. And on a good day, they can be ready in about 25 minutes. You’re already on to a winner! The beauty comes when you turn the volume up on that basic recipe, by adding different flavours. You could add different dried fruits, zests, chocolate chips, nuts and seeds. I’m partial to a fruit scone, my boyfriend, on the other hand, isn’t a fan of raisins. A compromise was necessary! So I decided to swap raisins out for walnuts and orange zest to make these walnut and orange scones. And let me tell ya, the results were GOOOOOOD. The orange zest, along with a little bit of orange juice adds a delicate citrusy flavour to the scones. It’s not super overpowering and tangy and when you pair the orange scone with a littleRaspberry Flax Seed Jam (my topping of choice) or Nutella (the boyfriends choice) it brings out the orange flavour even more. Add some walnuts for additional crunch and you’ve got yourself wonderfully flaky scones that taste incredible. All you need is some clotted cream and a brew and you’re good to go! Use your fingertips to rub the butter into the flour until you have coarse breadcrumbs. A few pea-sized lumps of butter are fine – these will melt and help the scones rise. Stir in the remainder of the dry ingredients – sugar, orange zest, walnuts, baking powder and salt. Combine the vanilla and orange juice with the milk. Then add the milk a little at a time, stirring to combine. Do this until the dough begins to come together – don’t worry if there is a little bit of leftover flour in the bowl. Turn the dough out onto your surface and bring the dough together with you hands. Use a rolling pin to roll out the dough until it is about 2 cm (¾ inch) thick. Use a cutter to cut out your scones, then place them on a lined baking tray. Roll out any leftover dough again to cut out further scones. Brush the tops of the scones with a little milk or egg wash, trying not to let it drip down the sides. Bake the scones in a preheated oven for 12-14 minutes until golden brown. Leave them to cool slightly before serving. Once the orange scones have fully cooled transfer them to an air-tight container. They are best eaten 1-2 days after baking, but will last 3-4 if stored correctly. Place the walnut and orange scones in the oven at 160 degrees Celsius for 5-8 minutes until just warmed through. Alternatively, you could use a microwave to reheat the scones. Pop them on a plate and microwave for around 10 seconds until just warmed through. 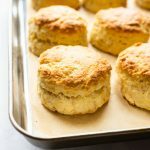 This isn’t something I have tested personally, but Serious Eats has a great post on How to Freeze Scones Before Baking, which you should definitely check out! Once the scones have cooled to room temperature transfer them to an air-tight container or freezer bag. When you’re ready to use them allow them to defrost at room temperature for an hour or so, then pop them in an oven at 160 degrees Celsius to warm through for 10 minutes. Eat straight away! 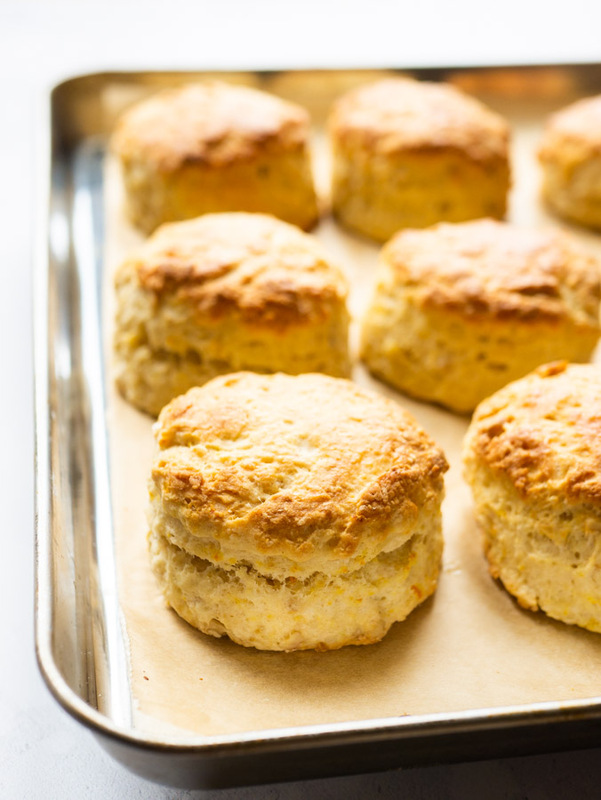 Make sure your butter is cold – this stops the butter from melting into the flour when it’s mixed together and means you will get more rise when the scones are baked. If you are using your hands to rub the flour and butter together, run them under a cold tap for a minute before you start, so they are nice and cold – this will help keep the butter cold. Instead of using your hands, which add warmth to the mixture, you could use a food processor to combine the butter and flour. Use the pulse option on your processor until the butter and flour are just combined. A few pea-sized lumps of butter in your butter-flour mixture is ok. When the scones are baked these small lumps of butter will melt and the steam produced will add rise and flakiness to the scones. But you want the majority of the butter combined with the flour until it reaches a breadcrumb consistency. When combining the butter and flour give your mixing bowl a little shake every now and again – larger lumps of butter will come to the top. You can then rub them into the flour. Once you’ve finished rubbing the butter and flour together, use a knife to mix the milk in. Using a knife helps combine the ingredients just enough and means you are a lot less likely to overwork the dough. Dust your pastry cutter with a little flour when cutting to avoid the dough sticking. When glazing the scones with milk or egg wash, try not to let it drip down the sides. This can inhibit the rise of the scones when they bake. Make sure your oven is pre-heated to the correct temperature before going in – if it hasn’t warmed up enough the rise of the scones will be inhibited. If your oven isn’t at the correct temperature when you’re scones are ready to go in, put the scones on the baking tray in the fridge to keep them chilled. To the bowl or food processor add your caster sugar, chopped walnuts, baking powder, salt and orange zest. 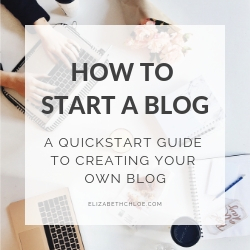 Stir or pulse to combine everything. To your milk add the orange juice and vanilla essence. Then pour the milk a little at a time into the dry ingredients, stirring to combine each time. Do this until the dough begins to come together. If you are using a food processor use the pulse setting, as leaving the machine to run constantly can cause overworked dough and, consequently, tough scones. The dough is ready when it just begins to come together to form a ball. There may be a little bit of flour that is leftover in the bowl – leave it. You do not want the dough to be wet and sticky. Tip your dough onto a lightly floured work surface. Bring the dough together with your hands and knead a few times. Use a rolling pin to roll out the dough into a disk that is 2 centimeters (around ¾ inch) in depth. 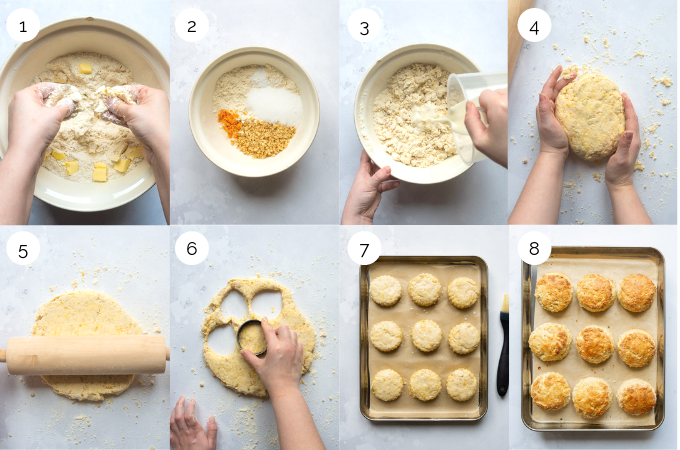 Use a pastry cutter to cut out individual scones, then place them onto your lined baking tray. When you can no longer cut out more scones, bring the dough together in a ball and roll it out again into a disk and cut out more scones. Do this until there is not enough dough left to make into a scone. Brush the scones with a little milk or beaten egg, trying not to let it drip down the sides of the scones. Bake the scones in the oven for 12-14 minutes until they are golden brown on top and have risen. Leave to cool slightly before serving. Enjoy! These scones were damn tasty! Mine didn’t look quite as pretty as yours but they were really delicious!